It is the time of the year and today is the day of Christmas 25 Dec .I would like wish you all " A wonderful Christmas and happy holiday." It has been quite a while that I didnt bake any cake. This week was a pretty stressful and busy week for me as my colleague went for holiday and I have to cover for him. Thank god it was a short week. Though I wanted to bake, I was just too tired and couldn't force myself to do any baking after work. Lucky that I don't need to go for work today and my phone was surprisingly silent since morning. It was a good sign and I managed to do baking without any disturbance. 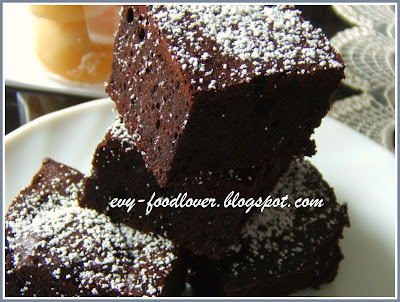 I baked chocolate brownies today and I used back my previous brownies recipe and just did a little bit of modification. Instead of butter, I used 1/2 cup of corn oil and sprinkled a little bit of icing sugar for decoration purpose. The color of the brownies is a little bit darker compare to previous time due to different brand of Cocoa powder. But the taste is alright, yumm. 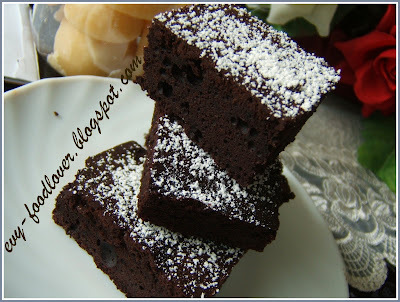 Ok here is the brownies and enjoy!